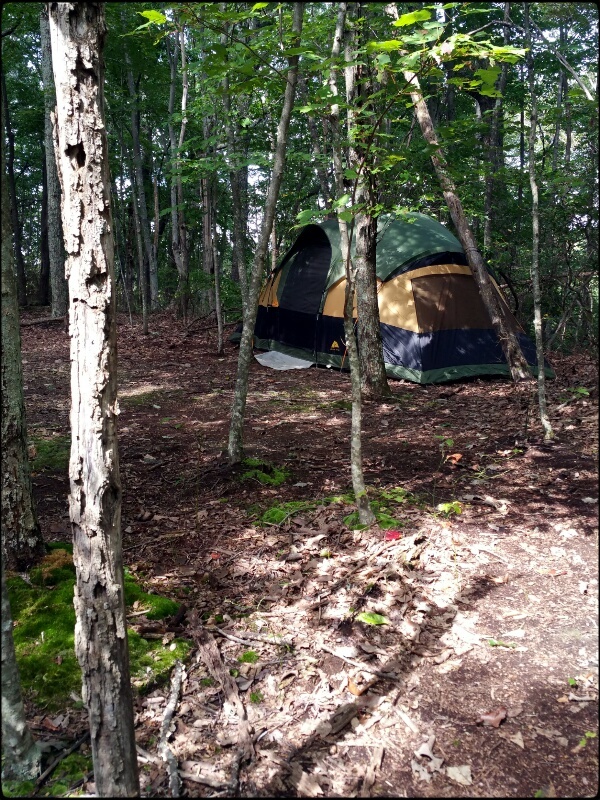 The husband and I pitched our tent on the mountain yesterday in preparation for a ten day vacation at the end of the month, and I couldn’t be more excited. The husband will join me when he can, but most of the time I’ll be solo. While trying to keep an open mind, I look forward to the time away from work and routine as an opportunity to rest, meditate, reboot my yoga practice, make new friends, and reconnect with old ones. I’m trying to approach it calmly. Meals during the time are covered so there’s no worry there. Naively, my biggest concerns are keeping my phone charged (they’ll be no network coverage but it’s how I read, take pictures, and blog), keeping my vape pen charged (I’m completely addicted to the stuff), getting my hands on enough coffee (hopelessly addicted to that, too), and staying warm enough (there’ll be a fire going night and day, so that should be okay). Part of me wants to take the plunge use the time to severe my dependence on my phone, caffeine, and nicotine cold turkey. Chicken that I am I’m planning to take some coffee and a French press and trust I can find a way to boil water. There’s a fully stocked kitchen so that shouldn’t be a problem. My timidity (does this surprise you about me?) asserts itself and I worry that I’ll get in the way of the flow of things if I show up at random times requiring hot water. As for keeping my phone and vape pen charged, I’ve ordered a solar charger that should arrive on Tuesday. I don’t know if it will work or not given the demands and the variables. It would be better if the the needs didn’t exist. My stay on the mountain will be interrupted near the end by my commitment to Sister Night, and later, the Nashville AIDS Walk. Sister Ann Wenita Morelove will attend both, though she may look more disheveled than usual being that she will be manifesting in the woods. I’m not happy with the timing. I’d rather go into this without the calendar conflicts. I’m trying to look at it as part of the experience. You can help me feel better about it by supporting my walk on behalf of Nashville CARES. I’d love to reach my fundraising goal before I leave for the mountain. Here is where you can donate. True camping means being able to dial 3 for room service. That is my piece of wisdom for today. Larry, I have to agree with you and add that “roughing it” is staying in a hotel that doesn’t offer 24 hour room service. Have a good time out there! I’m sure it beautiful. get rid of all the gadgets especially the cell phone!! As long as there is a place to make coffee you will be OK.
OK, I admit I’m a ad Gay. But, if you don’t mind my asking, who is the manufacturer of your cabin tent? I’m looking for something that can be reasonably waterproof/resistant and has a clear standing height of 6′-2″.